Yes, as Rod Allen said, that was, indeed, a “Little League home run.” But how can we tell it was? I mean, I guess we can just look at it and, because we’re savvy baseball cognoscenti, we can tell, well, sure, that was a Little League home run. I mean, come on, anyone can see that. But how do we actually know, for sure? There have to be some internal criteria we are applying, even subconsciously, as we watch that play that tells us instantly that what we just watched was, indeed, a Little League home run. So what I sought to do in my SABR presentation, and now in this article, is to establish a conscious, accepted definition for the Little League home run, or at least start the discussion about what the criteria should be. Batter scores on the play. That’s it. Simple, isn’t it? Simple is good. Simple is right. Simple works. It’s easy to query on, making the discovery of Little League home runs throughout history as simple as plugging these two parameters into a query tool. To try to find all the Little League home runs that have occurred in major-league history, we first need to determine how much history is actually available to us, in the place where these data live: the Retrosheet archives. Retrosheet, as you probably know, is the home of play-by play data spanning regular-season games, numbering into the six figures, played since 1921, as well as every All-Star and World Series game. The “bad” news is that not every regular-season game is available for us to query on. There are several missing seasons: basically almost everything before 1930, except for some games from 1921 (NL only); 1922; 1925; and 1927. In fact, complete seasons are available only since 1946. The good news is that, even with 50 entire seasons missing and portions of many others as well, we still have play-by-play data for almost 71% of all the games that have ever been played since the beginning of the 1876 season available to us. That gives us, as of now, exactly 148,390 games to query on, and that’s a pretty good sample size, right? The earliest recorded incident of what we would call a “Little League home run” that we could query on occurred in the 1911 World Series. Jack Barry was the batter for the hometown Philadelphia A’s, and he came up against New York Giants starter Red Ames in the bottom of the fourth inning of Game 6 of the series. The sharp-witted readers among you (and of course I mean you, specifically) have already noted that this kind of play was considered so unusual that it was referred to as “something new in baseball,” as though it were a bona fide strategy they were undertaking. And if you think about it, that makes sense: there had been fewer major-league games in history played at that point; hardly anybody in the country outside of the major cities had ever been to one; and there were practically no “moving pictures” of major-league games for people to watch which, even if they were available, would be seen only at the local nickelodeons alongside films of racy fan dancers and freakish fire-eaters. So it’s entirely possible that no one attending that game had ever before seen what we would recognize today as a Little League home run. Obviously, the news accounts of 1911 could not have referred to this event as a “Little League home run”, since the actual Little League organization itself was not founded until 1939. 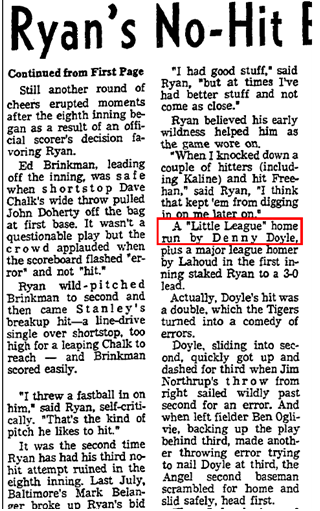 So I went rooting through newspaper accounts looking for the earliest mention of the term “Little League home run” I could find, as applied to a two-error batter-scoring play. The result came back as June 2, 1974, when the term was (first?) written out by a beat writer named Jeff Prugh who worked California Angels games that year for the Los Angeles Times. That ball was hit during the game played the day prior by Denny Doyle of the Angels off of Joe Coleman of the Detroit Tigers. Again, this is the earliest mention I could find, but if you ever happen to find an earlier mention, please send it along and we’ll correct this. So that takes care of the definition of the Little League home run, and its origins. In tomorrow’s post, we’ll take a look at some of the numbers and oddities surrounding the Little League home run phenomenon. We hoped you liked reading Little League Home Runs in MLB History, Part I by Chuck Hildebrandt! I think it is arguable that if the batter is credited with a double it cannot be a little league home run (I don’t believe it is possible to have two errors charged on a triple). Another perhaps more stringent definition would be when the batter scores on a ball that is not hit to the outfield (which would usually only happen with multiple errors but I’d guess it is technically possible that only one error occurs). Spoiler alert: we contemplate that in Part III. What of the fact that, over the course of baseball history, both errors and aggressive baserunning have slowly and steadily declined? For instance, in 1920, league-wide Fielding % was 96.6% and caught stealing % was 47.1%. Today those numbers are around 98.5% and 27%. The game used to a lot more wild and crazy and little league-ish. What I’m getting at is that theoretically Little League Homeruns should be much less common today than 50 or 100 years ago. If that’s true, it seems a bit unfair to use a static definition. And yes, it is impossible to have two errors on a triple, because the runner can advance home only on one error, not two. 1. The outfielder running after the ball, only for it to take a very odd hop off the wall and force the fielder to reverse direction and chase after it further. Not really the fielder’s fault, but it still looks comical. 2. Outfielder loses the ball in the sun really, really badly. As in he misses it by 50 feet or something like that. It’s not an error, but it is a bad play. 3. Wet field, outfielder runs after the ball then slides right past it. Bonus points for slipping while trying to get back up. Also, anything that bounces off a catwalk. Maybe I’m from a past era, but my little league field didn’t have a catwalk. Batter hits a triple but rounds third base. Throw comes in behind him and the third baseman tags him out – only he drops the ball for an error. Runner sees the loose ball and takes off for home. Third baseman picks it up with plenty of time and wings it right over the catcher’s head. Triple + 2 errors. Interesting. You might be right. My best argument against this is that the first “error” did not allow the batter runner to advance or prolong his time on the bases. If you take the same situation, but the runner does not run back to third, and the third baseman drops a throw (which would have made it possible for the runner to get back to third), but then picks up the ball as the runner is going home and throws him out, has he committed an error? Is the mere presence of the runner on the base, even for a moment, considered “extending his time on the bases” or does an extension actually require the play to end with the player on the bases? It depends by how much the runner overruns the bag. If the runner slides into third and comes off the base by a few inches and is tagged out (or in this scenario would have been out if not for the error), that should be scored a double. If he was going for home and stopped halfway down the line to retreat back to third, then that’s a triple. Still getting two errors on the play would be difficult, but probably doable. In your scenario I think they would give the third baseman one error as the drop allowed the runner to even make an attempt at home. Now if the throw to the third baseman was really bad and then the third baseman combined that with a terrible throw, then we might be cooking. It would give the scorekeeper a migraine though. If the play unfolded exactly as Jon L. describe it, that would be a double and tow errors, which would actually qualify it as a LLHR under the current definition. If the runner beats the tag but then the play ensues as Jon L. says, I think it would be a triple and one error. why not 2 errors on a tripple, the same player can make multiple errors during the same play. Dropping the ball for an error and then throwing it away for the second error on the same play. Yeah, but if you drop the ball it won’t be considered a triple. Even if, as Jon L. said, the batter has already rounded third and the throw comes in behind him?